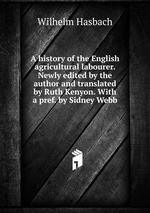 Аннотация к книге "A history of the English agricultural labourer. Newly edited by the author and translated by Ruth Kenyon. With a pref. by Sidney Webb"